A unplugged collection of classic favorites performed by the world's greatest patio party band. 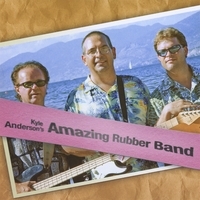 Kyle Anderson's Amazing Rubber Band has been a fixture in Penticton, B.C. since 1997. They play summertime patio party music at numerous venues in the Okanagan Valley. Kyle Anderson, Steve Jones and Ric Johnston serve up classic songs of the last 50 years with a big dash of humour and fun! See our website: www.amazingrubberband.com.